With the opening of his beloved Disneyland, Walt Disney radically changed the experience of going to an amusement park. Florida's vast Walt Disney World upped the ante with multiple parks, hotels, shopping districts, and more, and changed the very notion of what it means to go on a vacation. Many visitors, however, chow down on the same nondescript fast food typically found at traditional amusement parks. Not that there’s anything wrong with burgers or chicken strips. But they are missing out on some extraordinary restaurants at the resort and an opportunity to make their vacations more memorable. But, as with everything else at the gargantuan resort, there are a ton of dining choices. Among the hotels, theme parks, water parks, Disney Springs, and the Boardwalk area, there are over 400 restaurants. How could anybody whittle so many eateries down to a more manageable list of the top picks? That’s a tall order. As theme park fans, we spend a lot of time at Disney World. But we’ve hardly made a dent in sampling all of the restaurants. That’s why we’ve enlisted the expert help of Lyn Dowling, a Florida resident, veteran restaurant reviewer for Florida Today, and frequent visitor at Walt Disney World. After countless meals and musings, she has narrowed down the resort's huge collection of dining places and curated her top choices to share with us. Note that reservations are highly recommended for table service eateries, whether they are located at Disney Springs, the parks, hotels, or anywhere else. It’s especially true for most of our top picks, which are generally quite popular and in high demand. Reservations can be made up to six months in advance. 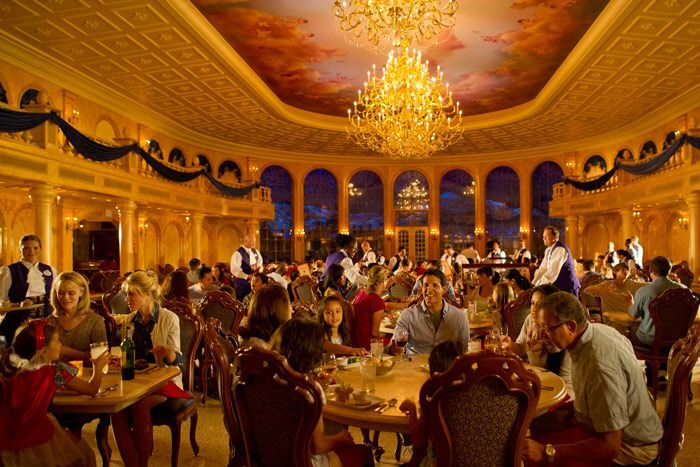 Get the info you'll need to make advance Disney World dining reservations. Sometimes (usually in the off-season), Disney offers limited-time deals that include hotel and park tickets packages with free meals. Are they good deals? They could be. Find out more about Disney World free dining. Whether you're planning an elegant meal, want to grab a quick bite before you journey to Mars on Mission: SPACE at Epcot, or anything in between during your Disney World visit, you’re sure to find restaurants to please your palate as well as your wallet with these picks. Let’s start our culinary tour with the resort’s top table-service eateries. These include all of the theme parks and hotels, but not Disney Springs (which has so many places to eat, it has its own category below). Because they generally cost more money and take more time as patrons tend to linger longer, you would probably want to limit your table-service meals. But with these picks, you would be in for a tasty treat. Among the top choices are California Grill at Disney’s Contemporary Resort, Flying Fish at Disney’s Boardwalk, and Be Our Guest at New Fantasyland in the Magic Kingdom. The complete list of Disney World’s best table-service restaurants includes all of the satisfying spots. None of the restaurants that made the list offer opportunities to meet Mickey Mouse or his pals. But meals with characters are a very popular option at the resort. Learn more about Disney World character dining. None of the picks are buffets either, which aren't, exactly, table-service restaurants. (Nor are they quick-service.) Disney World has some great buffets, however, and they can be great choices. The very best buffet, in our opinion, is Boma - Flavors of Africa at Disney's Animal Kingdom Lodge. Boma offers all-you-can-eat fare that can be surprisingly exotic and incredibly delicious. It includes African specialties as well as less adventurous American dishes. It is among our favorite restaurants anywhere, let alone at Disney World. The cost is high ($30 to $60 per adult). At Disney World's quick-service eateries, patrons order their food at a cashier or counter and cart their meals to a table. Quick doesn’t necessarily mean conventional fast-food fare (although there is plenty of that available if that’s what you and your park posse are seeking). In fact, some of the quick-service picks offer surprisingly creative dishes. Satu'li Canteen, the restaurant at Pandora – The World of Avatar in Disney's Animal Kingdom, for example, offers bao buns, grain bowls, and an out-of-this-world-looking blueberry cream cheese mousse dessert. Other eateries include Katsura Grill at Epcot’s Japan Pavilion and Columbia Harbor House in Liberty Square at the Magic Kingdom. The complete rundown of the resort’s best quick-service eateries will give you plenty of choices for your next visit. To help make quick-service meals even quicker, you could use Disney World’s mobile order feature. It enables visitors to order meals in advance by using the My Disney Experience app on mobile devices. Disney World doubled the size of the former Downtown Disney and renamed it Disney Springs in 2015. It is now so enormous in its own right, and has so many places to dine, we've created a separate list that focuses on its top restaurants. The list includes both table-service and quick-service eateries. Among the choices are Raglan Road, with its wonderful Irish fare and libations, Enzo’s Hideaway for its cool ambiance and Italian cuisine, and Morimoto Asia Street Food for its chicken ramen, octopus fritters, and other tantalizing delights. When people go on vacation, they tend to cast their healthy eating aspirations to the wind. As you might expect, Disney World has plenty of tempting treats to get you to temporarily ditch your diet (and please your palate). Among the top picks are chocolate croissants at Epcot’s Les Halles Boulangerie & Patisserie, the ever-popular Mickey ice cream bars (available at multiple locations), and (of course) pineapple Dole Whip at Adventureland in the Magic Kingdom. The full list of Disney World’s best snacks and desserts has plenty more choices.